Black beauty ultra germinates faster due to frontier perennial ryegrass. Fills in damaged lawn areas because of blue-tastic kentucky bluegrass. 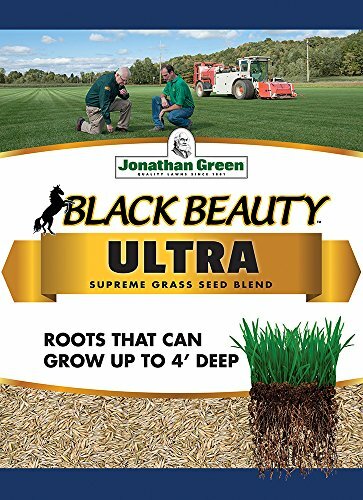 Black beauty ultra also has the three grasses in regular black beauty. These grasses grow a naturally dark-green and beautiful lawn. 30 Percent dakota fescue, 30 percent taos tall fescue, 10 percent blue tasic kentucky bluegrass, 10 percent frontier perennial ryegrass. Germinates faster and fills in damaged lawn areas better. Grows well in clay or sandy soils and in full sun or partial shade. Contains naturally inset resistant grass. This contains 7 pounds and covers 2800 square feet area.